Black Bear Airsoft is a manufacturer of high quality mesh airsoft masks, and they recently reached out to Airsoft Retreat through their distributor, ACM Gear to have us evaluate their offerings for the airsoft community! They produce a fair assortment of masks in a variety of colors and designs, and today we're going to be taking a look at their first model, the V1 Shadow. This review project is a little bit different, as you're not just getting my opinion on the product, you're getting the opinion of several people throughout the airsoft community, including my team, various members of Airsoft Retreat, and other review writers throughout the country. Over the next few months, we'll be doing reviews of their entire mask line-up, so keep an eye on Airsoft Retreat for more information on these masks! As mentioned before, I was sent these masks directly by ACM Gear, who is the current distributor for the BBA masks. They are working on getting US based distribution as well, and I will update the review once they've secured it. This model is available HERE, priced between $16 and $18, depending on the color chosen. It is available currently in Tan, Coyote Brown, Black, ACU Grey, OD, or with Woodland or Skull painted designs. I was sent the Tan, Woodland, and Skull designs to review, but today, we'll be taking a close up look at the Woodland and Skull models. This mask design has been seen before, made by different manufacturers, but BBA took the design and improved upon it in several ways. For one, it uses thicker, beefier steel in the mesh portion, and higher quality fabric for the surrounding material. It also uses dual straps to hold it to your head, instead of the single strap used by most of these types of masks. This holds it to your head MUCH better and keeps it from flopping around while running like the TMC mask is prone to doing. The overall design is quite comfortable and low profile, while still providing complete mouth coverage, and allowing you to keep a good cheek weld while aiming your rifle. The Shadow masks came packaged in a simple plastic bag, without any labels or markings. I believe retail purchased masks will be in individual boxes to prevent damage during shipping. The first impression on looking at the masks themselves, especially the skull painted ones, was just how awesome they looked. I've used some other mesh masks before, and the overall quality of these looked much higher. The Shadow mask is the most compact of Black Bear Airsoft's mask offerings, giving you fairly complete lower face coverage with a small overall size. The mesh is strong, but flexible enough to be bent to fit your face, something I recommend doing, as everyone's face is shaped differently. The biggest complaint that I've heard about this mask design is that the nose piece is too small to fit comfortably, which can largely be alleviated by bending the nose piece out to give a deeper pocket, but some users may still find it uncomfortable. In my testing, I was able to make it fit just fine, so your mileage may vary. The mesh itself is made of low carbon steel that is powdercoated for high strength and durability. The designs are then painted on, meaning that you may get some paint chipping or other wear, but the main surface of the mesh shouldn't chip or flake off with normal use. As mentioned before, the mesh is flexible enough to be bent to fit your face, but is strong enough to keep you safe from BB hits. My group tested this in two ways, first by shooting it point blank with my 500 FPS M24 sniper rifle to check for any BB intrusion, and then to torture test it with a full auto 300 round burst from 2' away with a 400 FPS AEG. With the first test, I put 5 rounds on it in the same spot, and didn't have any penetration, only a reasonable dent. With the full auto test, the mesh was dented throughout, but there was no penetration of the mesh. To do a comparison test, I did the same test with a TMC mesh mask of the same design, and it fared quite a bit worse. The TMC mask basically crumpled like a piece of tin foil during the AEG test, which I believe is due to the much thinner mesh material. The mesh is secured inside a fabric surround to keep it comfortably on your face. The sides have loop side velcro portions to secure the d-rings that hold the retaining straps. As mentioned before, this uses dual retaining straps for comfort and security. The fabric surround is glued to the mesh using a high temperature adhesive, however, if you leave the mask in a hot car, you MAY have some separation. So, how does this thing fit? In my case, I was able to adjust it to fit my face quite well, and still be able to use my preferred Revision Wolfspider goggles with my glasses underneath. I do have a slight amount of pressure at the bridge of my nose, where it meets my goggles, but it's not anything that causes me discomfort. With my wide face, the edges of my cheeks/jaws stick out the sides a little bit, but it does allow me to maintain a solid cheek weld. So, that's really the long and short of it. It's a good design, however, some users have reported that the nose portion is too small to wear comfortably. Some of the other BBA masks have much more space in the nose region, so if you have a pronounced nose, you may want to look into their other offerings. 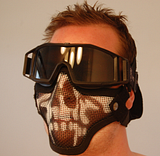 If you're looking for very low profile, well ventilated lower face guard, then the Black Bear Airsoft Shadow mask is certainly a viable option. It doesn't fit all users faces perfectly, but that is what some of the other masks in BBA's lineup are for. This is designed to be one of the smallest lower face guards that you can buy, and as such, it's kind of a no-frills design, but it certainly gets the job done. For more options or more comfort, check out some of the other BBA half masks such as the Raider or Stalker designs. ASR will have reviews of these other masks posted soon, so keep an eye on us for more info! 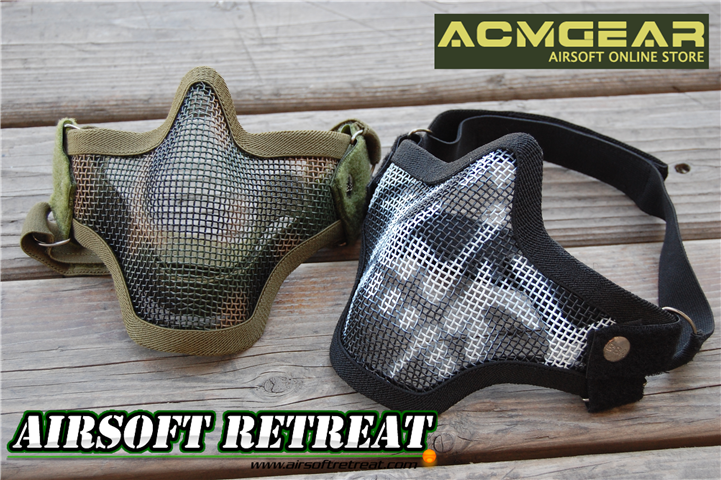 Many thanks again to ACM Gear, and of course, Airsoft Retreat! Also, thanks to Orca, Xaviermace, Aznriptide, DTRSandman, and the entire crew at Wasteland Airsoft for their testing experiences!